Record reviews, playlists, original articles, and more. The blog is where we talk music, record collecting, and more. "There's a lotta things about me you don't know anything about, Dottie." Here's something we're sure Dottie didn't know: there are a surprising number of records that bear Pee-wee's name. We hit the net looking for Pee-wee vinyl and found a bunch of records. Some feature Pee-wee singing, several were rap records about Pee-wee (for real--several! ), there's a recording of the early Pee-wee stage show, the movie soundtracks, and then a couple of records where Pee-wee contributes in a cameo capacity (like on Cyndi Lauper's True Colors LP). We've picked just five to highlight, but tweet at us if you've got one you think is worth noting! Pee-wee himself sings the entirety of this bonkers beach classic. It was recorded for the 1987 film "Back to the Beach," and is worth hearing just for song's ending which features Pee-wee shouting 'gnarly!' 'radical!' 'bitchin!' and 'tubular!' probably because those are cool beach words. This here is just a curious little piece that we have been desperately searching for. It's an original cast recording of the songs from Pee-Wee's live stage show from 1981. Amazing. And damn hard to find! This collection of rap songs about Pee-Wee is real. Little T Meets Pee-Wee is performed by a child. So, yeah this one is worth tracking down, if only to satisfy your curiosity. It's a pretty cool picture disc that's a pretty rare find! 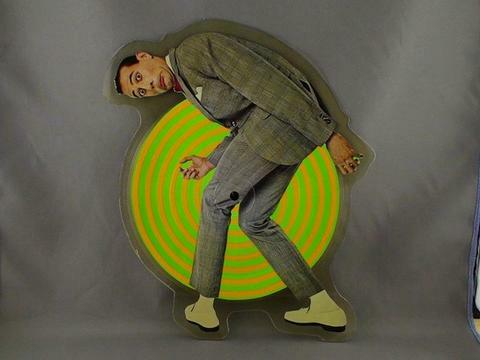 The song is awful, but it's a Pee-Wee picture disc! We love it so much (we know, we know, why don't we marry it!). What Are Record Clamps and Do They Make A Difference?